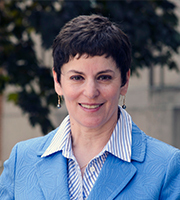 Risa Dinitz Lazaroff is a Professor of Legal Research and Writing and the Academic Director of the Externship Program at Capital University Law School. She teaches Legal Analysis, Research, and Writing, Legal Drafting, and Appellate Advocacy and is the advisor for the Civil Litigation Concentration. She is also a writing consultant for the law firm of Frost Brown Todd LLC and the Columbus office of Ice Miller LLP. Before she began her teaching career, she practiced insurance defense litigation for health, life, and disability claims and served as a staff attorney for the Ohio Legislative Service Commission. She earned her A.B., with High Distinction, from the University of Michigan and her J.D. from The Ohio State University, where she was the Chief Managing Editor of The Ohio State Journal on Dispute Resolution. She is a member of the Chief Justice Thomas Moyer American Inn of Court, the Ohio State Bar Association, and the Legal Writing Institute. She is licensed to practice law in the state of Ohio, the Southern and Northern Districts of Ohio, and the Sixth Circuit Court of Appeals.